Highly recommend, paid for less and got an upgrade, private apt with bathroom! Very satisfied. Thank you for the accommodations Hotel Madrid. Hostal Madrid was excellent! Very conveniently located between Sol and Plaza Mayor. Staff very friendly. Room and bathroom clean. Beds comfortable. My stay at Hostel Madrid was great! The hostel was very clean and the staff is VERY friendly. I missed a bit some interaction with other guests. Even though I wiuld higly recommend it! The location is also a big plus! We rented a double bedroom for the week. 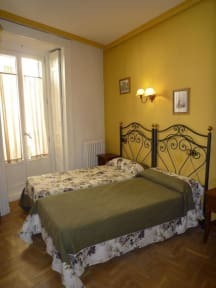 It was nicely decorated, cozy and very clean (the room/bathroom was cleaned everyday, our beds done). The staff was extra kind and helpful. 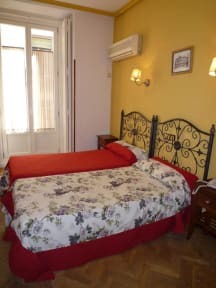 The location is perfect: close to nice walking/shopping streets, the museums (Prado, Sofia Reina, Arquelogico) can be reached in 10-15 minutes on foot. The building can be a bit noisy (slamming doors, loud footsteps, reconstruction in some apartments not belonging to the hostel), so earplugs are a must. FABULOUS location. Spacious apartment. Friendly, helpful staff. Would definitely stay here again!! Very good place in the heart of Madrid. If you are a solo traveller and want to meet others, perhaps it is not the best place; but for cleanness and localization, the place is graet. Great location! But the room was really loud, because its next to the reception. If you want to sleep longer, don't stay in room 11.